My name is Summer because just looking at me makes you think of a bright, cheerful summer day, full of warmth and fun. 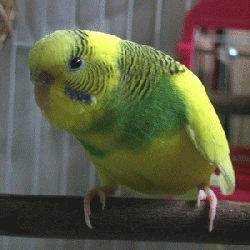 I`m a very young, buttercup yellow budgie with green highlights that was turned into a shelter when my people moved to a place where birds weren`t allowed. Can you imagine???? I really like people! you do such interesting things! My foster mom feeds me lots of unusual stuff, like veggies and pellet things and sprouts ? they?re all good! I like to eat all the time, and I?ll even eat right out my foster mom`s hand. She also put toys in where I can play with them! toys are wonderful! You can chew on them, and they make noise, and they even try to move around! This is a nice place to stay, but I really want a forever home, one where a little bit of summer sunshine would be a welcome gift. Doesn`t someone out there want to be cheered up?